Got Black lines running down your gutters? Dont be decieved those black streaks are harder to come off then you think. Most home owners try and are not successful - Call a professional and we will get them looking new again. Leaves, dirt and other debris have potential to clog up your rain gutters. Most home-improvement experts recommend that you do gutter maintenance once a year. Clogged gutters can cause so many problems that it’s worth the effort to clear them. You can clean them yourself or call us and we will handle the job. Why maintenance? Here’s why. 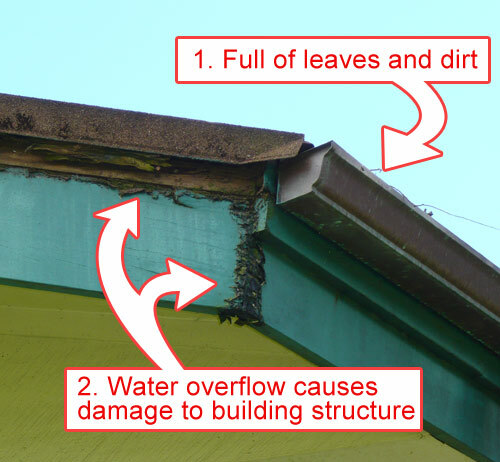 If you have siding, continuous leaks from the roof can warp them or create mold issues that affect your entire family. Pooling water in your gutter can rust metal gutters or rot wooden ones. In the worst-case scenario, clogged gutters and faulty drainpipes can funnel runoff down your exterior walls and into your foundation.